It seems a new trend has begun to spring up in energy drinks: "the energy mixer". Hijinks Energy Drink Mixer, like 5150 Juice and Catalyst, was created to allow you to create an energy drink out of your other favorite beverages. Taste is a relative category in energy mixers, but I have chosen to add Hijinks to three different drinks as well as drink it straight. My first choice was to add it to orange juice for a morning drink. To my surprise, I could tell that the taste was slightly different, but it was still very good overall. I next added a Hijinks to an A&W Root beer. In that instance, there was no noticeable taste other than the root beer goodness. For the last drink, I chose to add it to a Gatorade, and I could not distinguish the caffeine taste in the drink. As for the straight shot, Hijinks was pretty brutal. It started off clean, but there was an extreme bitterness that completely overpowered my mouth. Hijinks has a great ingredient profile. First, each shot delivers 200 milligrams of caffeine (which is substantially larger than the typical energy drink). In addition to that, the rest of the “energy blend” contains Taurine, Inositol, Glucuronolactone, and Carnitine. All of this comes with only 10 calories and 2 grams of sugar. The kick that Hijinks Energy Mixer delivers is great. Each time I had one, I felt a decent buzz set in around the middle of my drink, and it lasted for several hours. I had the orange juice before work, and it allowed me to stay on task for the rest of the day. I drank the Gatorade before a heavy workout, and I felt energized throughout. Shooting Hijinks straight gave me jitters for a while, and the buzz set in much quicker. In simple terms, Hijinks energy mixers are awesome. Not only can you turn your favorite beverage into an energy drink, you can make it more powerful than most energy drinks on the market. Sugar content: 2 grams (per 1.1 ounces). How Does Hijinks Energy Mixer Compare? 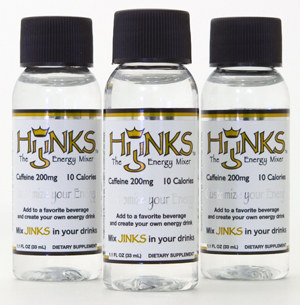 Hijinks Energy Mixer contains 181.82 mgs of caffeine per fluid ounce (614.80mg/100 ml).